Three friends founded Azienda Agricola COS, in 1980 in Vittoria - Sicilia : Giambattista Cilia, Cirino Strano and Giusto Occhipinti. The acronym of their last names is where the name for the winery – COS – comes from. In 1980, they were the youngest wine producers in Italy. They received an old family winery from Giambattista Cilia’s father Giuseppe Cilia and the nearby vineyard of bush trained vines in the famed town of Bastonaca. On October 5, 1980 they harvested their first vintage and made 1,470 bottles. The winery follows the principles of biodynamic faming and for vinification, they decided to use terracotta vases that left no traces or aromas on the wine but were completely neutral vessels. In 2000, Pithos was born, a Cerasuolo di Vittoria that ferments and ages in amphora. In 2005, they made the first wine that bore the Denominazione d’Origine Controllata e Garantita (D.O.C.G.) designation, the only one in Sicily. The harvest of 2007 saw the winery in a new location and was the beginning of use of only amphora. 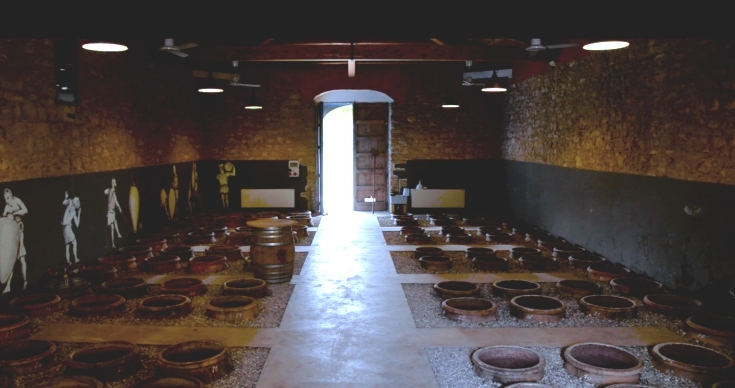 The winery got rid of the barrels that they had and use only 150 amphoras’, one of the largest of its kind. Grecanico 100% from red soil, medium consistency; formed of subalpine sands of Pliocene origin, of limestone - siliceous nature, interwoven with compact layers of fresh clay and calcareous tufa. Fermented spontaneously in terracotta amphorae on the grape skins with indigenous yeasts. Aged in amphora and bottle. The Azienda Agricola COS works with biodynamic principals of agriculture, a method that is based on the philosopher Rudolf Steiner’s teachings. These teachings incorporate the ideas of organic agriculture while at the same time they use a holistic approach that considers the earth and the vine to be part of wine system that develops together. With this philosophy in mind, the COS winery works using their ancient traditional techniques to cultivate vines. COS thinks of themselves as being the head of the family that looks after their vines, including pruning in a ways that is best for both the vine and the grapes. Biodynamic agricultural farming means respect for what nature offers and not looking to ask for more than what is available. For this reason as well COS has a project to use the water from their winery and to compost the material they have from pruning. COS's compost uses neither chemicals nor artificial ingredients. WINE IS OUR SOUL, OUR JOB, OUR RHYTHMS, AND OUR ART. Wine is a body, a substance, the lifeblood of fruit that has been nurtured by the light of the sun and the depth of the earth. Wine is work, the child of knowledge that goes into making this product and into transforming it in order to guide it in a new direction. Wine is the fruit of patience, patience that is needed to work with what each season provides us with, our efforts and then waiting for nature to work its magic. Experience is the key and the knowledge and the ability to be patient. Wine is art. A force that is able to dominate chaos and give it order and meaning. It is an art that is not immediately understandable for everyone but only to those who are able to pick up the nuances that make up its identity.